"So modern, so advanced you'll have to see it - and try it - to believe how easy it can make even the fanciest stitching." Is it too late to put this on my list? I love these! I want one of each! I've got a few of those oldies in my garage that I got an auction. I can't GIVE them away! But they look so cool... Maybe someday I'll have a big display case full of them just to gaze at! Or start my own Sewing museum. Ahh! 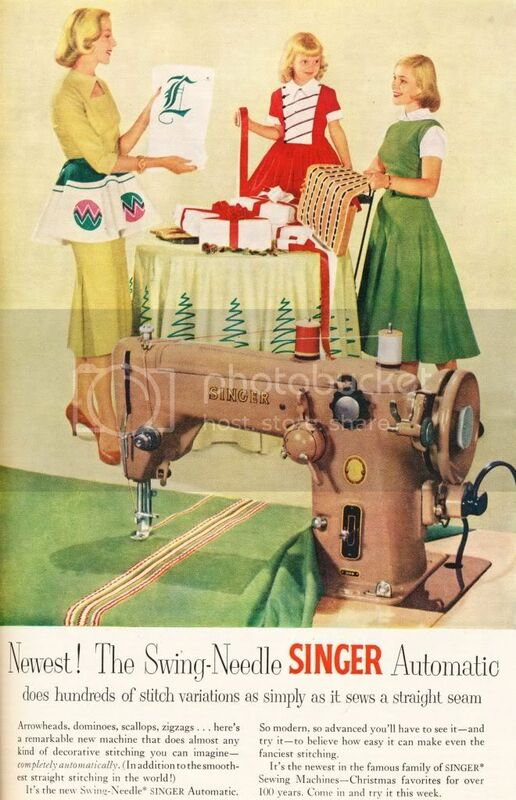 The slant needle model was the 'new machine' my mom got for Christmas that year, and that's the machine I taught myself to sew on: a simple to use, heavy duty and long suffering machine. Thanks for the 'memory lane' moment! Last Minute Gifts - Kleenex Box Covers!